Taken just a couple of minutes after this image, I was so grateful for the rain. It wasn’t heavy rain that made you want to run back to your car. It was just enough rain to make the petals fall a little from the trees but also create these amazing puddles. On a typical sun shiny day, it’s not surprising to see one or two puddles at the Tidal Basin. But on a day like last Friday, there were puddles almost every corner you turned. 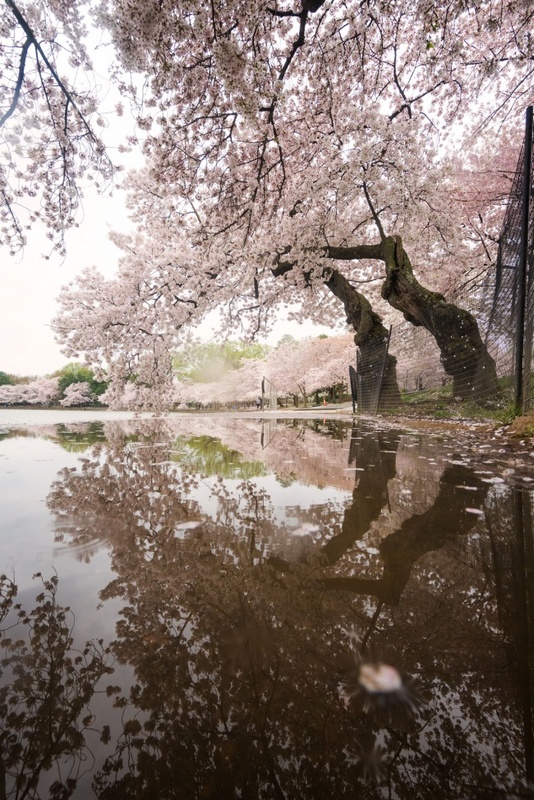 Although they aren’t great for the cherry blossom trees, they are really cool to create these reflection shots. #savethetidalbasin. The other great thing about the rain is that they scare away a lot of potential visitors. For a moment there, I thought I had the whole Tidal Basin to myself! I was about to start blasting music from my phone before I saw a group of runners run past me. I should have brought my ear phones. But I’m glad I got a few minutes alone with this puddle. I had never seen one form around this area so I took advantage of the opportunity and shot a couple of shots. Pro tip: It’s said to say but everytime you visit the Tidal Basin, you should wear waterproof boots. That’s the only way you won’t can really avoid getting wet but still get puddle shots like this. In case you were wondering, I was at the Basin again yesterday. It looks like a majority of the trees have lost a significant amount of petals over the weekend. They’re still beautiful and worth the visit if you still haven’t been this year. It just won’t be as pink and fluffy. My camera settings for this image is F7.1 at 1/125th sec and ISO 1000 with my Sony A7II and 16-35mm wide angle lens. 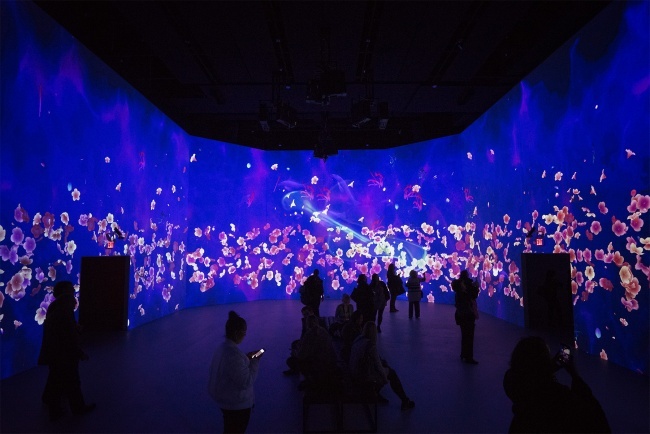 Earlier this week I had the pleasure of attending the Artechouse‘s preview event for their latest installation called “Sakura Yume | Cherry Blossom Dream”. It definietly hyped me up for the real Cherry Blossoms blooming later this month! One of my favorite things about visiting the Artechouse is the peaceful atmosphere it creates. 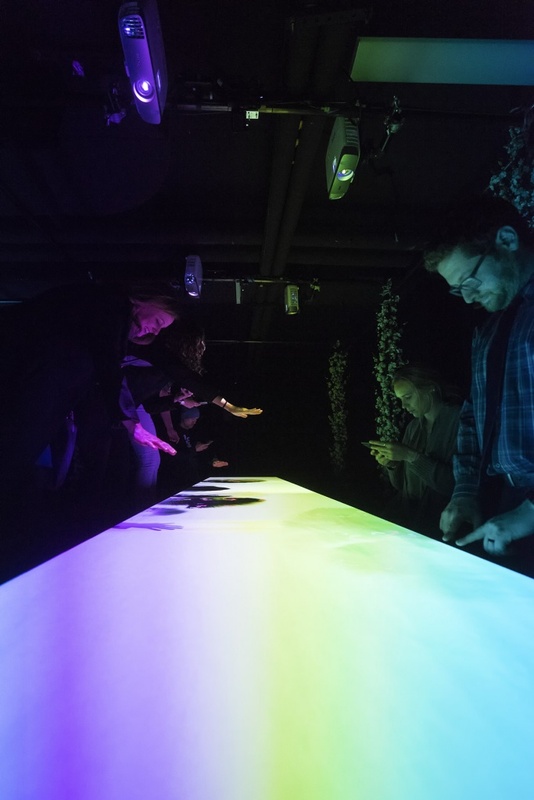 The room is very dark, they have beautiful, calming music playing and everyone just seems to relax and enjoy the installation. This one in particular was very cool because 1. I love cherry blossoms and 2. it seemed like there were little surprises at every corner. For example in the main room, if you stood there and watched the wall for a while you’ll see a koi fish swim past or some Japanese lettering floating around. It was definietly a very cool experience. However my favorite part was in the room where they are going to have their immersive food experience. It looks so cool. Basically everyone sits down on a cushion on the floor and you can ‘play’ with the table and watch all these colors and shapes appear right before you. Here’s an image of what it looks like. I took this pic with my iphone. Between the tables are columns of these cherry blossom branches. It seemed like the perfect place to have a little photoshoot. 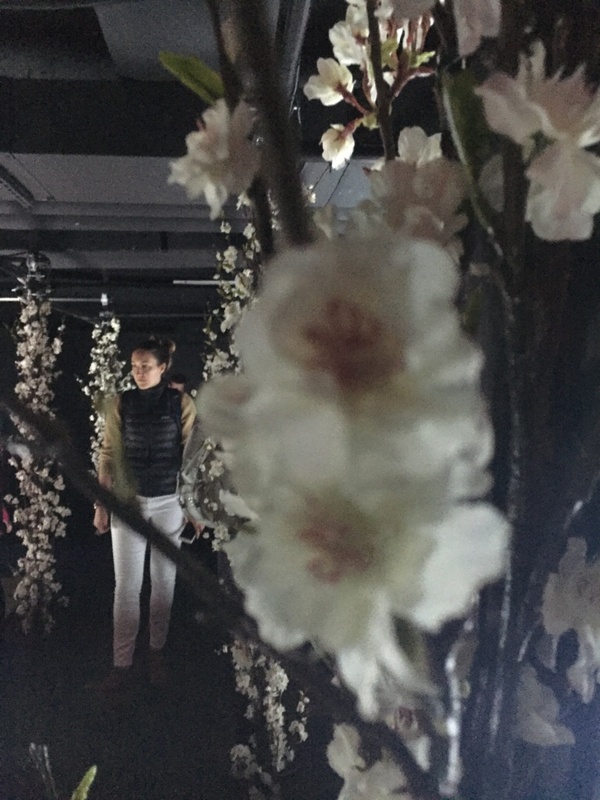 So if you haven’t seen any of their other installations or if you’re a cherry blossom fan like me, definietly go and check it out. It’s probably one of my favorites that they’ve had there. If you’re interested, here’s are a few images from past visits. My camera settings for this image is F4.0 at 1/100th of a second at ISO 5000 with my Sony A7II and 16-35mm wide angle lens. Like I said before, this room is super dark and no tripods. I love this camera in low light situations! Oh snap! I can’t believe I still haven’t blogged this image yet. I’ll let you all in on a little secret. I have a folder on my computer desktop called “Haven’t blogged yet” (very creative, I know). It’s the place where I dump all the images that I’ve worked on but haven’t blogged about it yet (hence the name of the folder). Usually all these images have already been on my instagram. It’s just so much easier for me to throw things up on there but when it comes time to blogging, I am a lot more thoughtful and careful with what I’m saying. So I need to keep a folder to make sure all these cool images end up on the blog. When it was time to write today’s blog post, I went back into my trusty folder and found this one! I took it the day I left for New York. It was the only day of the week that called for cloudy/slightly rainy skies. Those are words are like music to my ears because that usually means colorful sunrises/sunsets and I was right! But the best part of this morning was that the colors lasted for so long. Probably a good 20-30 minutes of amazing color. I was surprised and super grateful to have the extra time to try to come up with different compositions. So in case you were wondering, this was shot close to Netherland Carillon in Arlington, VA. Its one of the only places I know of that you can get all three of these iconic DC monuments all lined up like this. 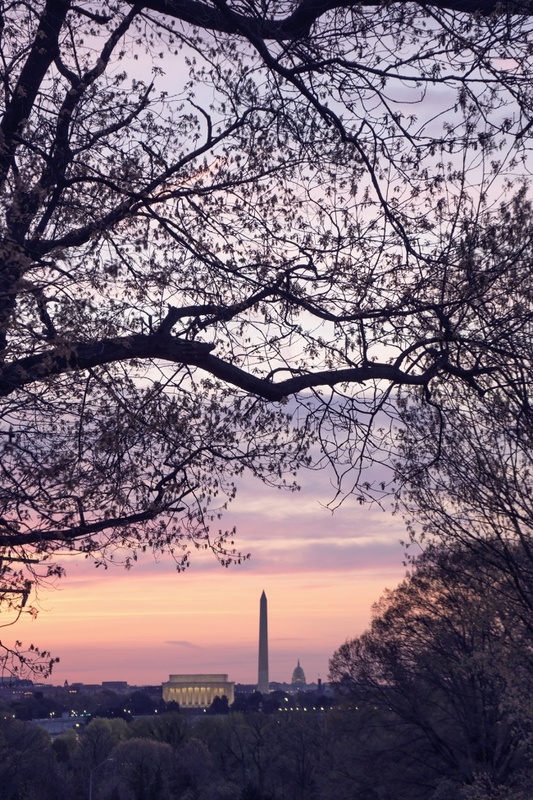 I tried my best to use my “cherry blossom skills” to frame the Lincoln Memorial, Washington Monument and Capitol building all in one image using the trees around me. I’m pretty happy with the results. What do you think? Out of all the cherry blossom images I took this year, this one has got to be my favorite. I admit theres not as much color, saturation or editing that was involved in this one compared to some of my other images but I can’t help but love the mood it evokes. 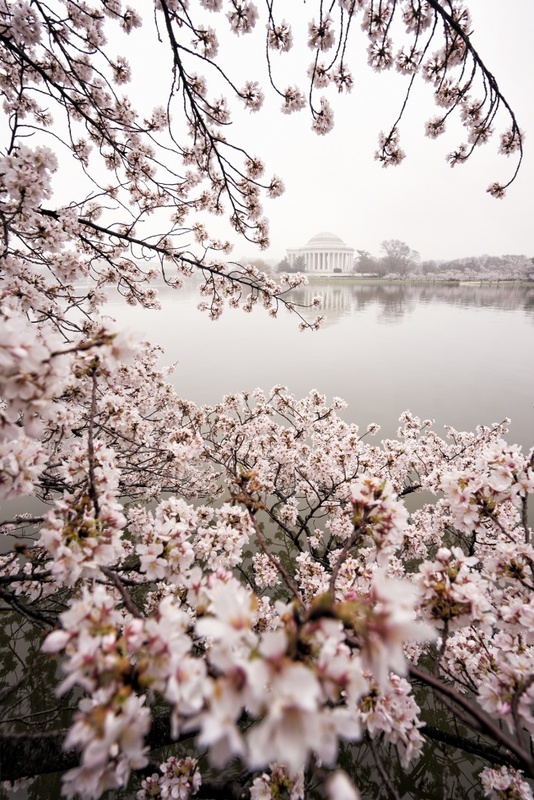 It’s also a take on the cherry blossoms that I don’t think I’ve ever seen before from the Tidal Basin. It was from last Monday when it was super foggy out. I had been walking around all morning capturing the fog and was having a total blast. But like everything else, the fun had to stop at some point. I walked the scenic route back to my car from the Jefferson Memorial and was stunned when I saw this. 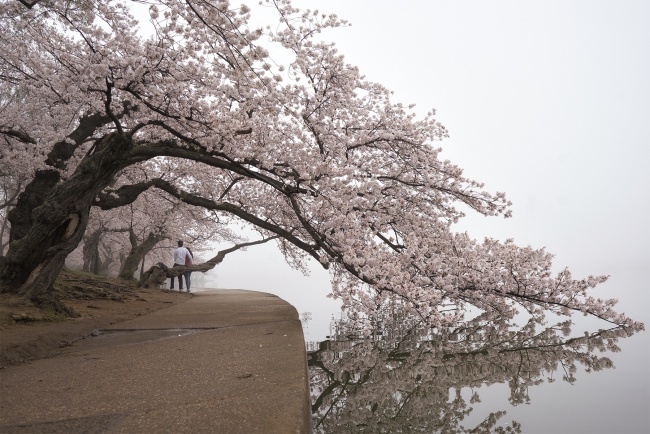 The high tide had risen so high that the low hanging cherry blossom branch was able to touch the water. It was just so soft and delicate, I had to find the perfect way to capture it all. It was also amazing that there was barely anyone around. Maybe because it was a Monday morning and most people were at work at that time, but everything was just so silent and still. The couple sitting on the branch had been there for a while taking selfies. I had to include them to convey a feeling of peace and calmness of just relaxing on the tree trunk. My camera settings were F/6.3 at 1/80 of a second ISO 200 with my 28-70mm. No particular reason for my lens choice. I think I had just been walking around with it on and didn’t feel the need to switch to the wide angle. I wanted to capture the scene as quickly as possible. It finally happened! The cherry blossoms peaked! And they are so much better than expected. They actually look like what they’re supposed to. Fluffy white/pink clouds on trees. It’s what I’ve been waiting for all year long. Previous weather reports said that only 50% would blossom. I’d disagree and say there’s at least 75% going strong. Obviously there are some trees here and there that didn’t quite make it through the spring-winter, but the ones that actually did are so worth it. Yesterday morning I woke up, pulled out of my drive way and the first thing I saw was the fog. For some reason my first reaction was a malicious laugh. I was so excited to check out how the fog affected the Tidal Basin. The water levels were high, the fog was amazing and I had a blast walking around all morning. I felt like the more the day went on, the better it got. Eventually the fog was was dense that you couldn’t even see the Washington Monument or the Jefferson Memorial. It was nuts. (But so perfect at the same time). I shot this image right before the Jefferson got totally covered. I shot this at F9 1/20th of a second ISO 200 with my 28-70mm. If your camera has live preview, I’d highly recommend shooting with that feature. I feel like I can compose my images so much better when I’m in live preview as opposed to using the eye piece. I think it’s because you can see EVERYTHING plus its just an easier perspective to see. I don’t think I would of been able to see this image without live preview. The end of the morning was a bit crazy however. I was taking some final images when I ran into my friend, Alana. I said “hi” to her and my tripod fell into the the Tidal Basin!!! How CRAZY IS THAT?! I still can’t believe it. I think I’m going to have to make a youtube video to tell you the whole story.